Theresa May’s cabinet had to hand in their mobile phones as they walked into their day-long Brexit discussions Tuesday morning. Historically, the reason for this move has been to prevent agents of foreign powers from hacking into the devices to listen in to the government’s most secret discussions. These days, any spy who wants to know what the cabinet has been talking about simply needs to check Twitter 10 minutes after the meeting finishes, as rival ministers describe their versions of events. From these briefings, it has been possible to put together a picture of the day. First, they had a political cabinet. That means it was a Conservative Party event, without neutral civil servants present. The idea was to thrash out the issue that risks tearing the governing party apart. May opened the session, setting out a series of areas where she wanted people’s views: Parliament was refusing to agree to her Brexit, but also refusing to agree to any other sort; a no-deal Brexit would involve economic pain; a long extension of negotiations was undesirable. For any kind of extension, she would need a plan to take to the European Union on April 10. The meeting was shown internal polling on how the Conservatives, at war with one another on their central policy, would fare if they called an election. It wasn’t pretty. They went around the table, and everybody spoke. Some spoke more than once. It lasted four hours. Shortly after 2 p.m., they reconvened, this time as a proper cabinet, with officials present, and minutes taken. May’s plan to call the opposition Labour Party in for serious compromise talks was taking shape. 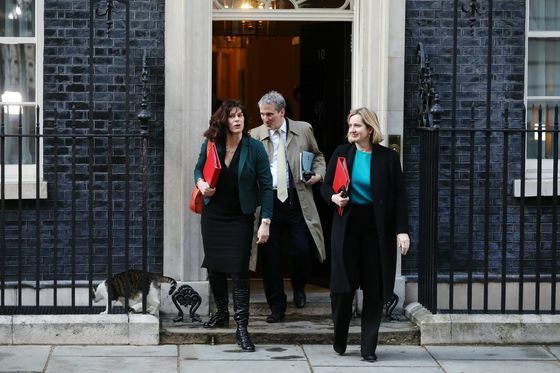 Even before May announced that she plans to quit, there has been a pattern of ministers saying things to the cabinet that feel like they might have been prepared in advance, and with a wider audience in mind. One of those who was present Tuesday observed that some cabinet members’ opposition to things that would be unpopular with those electing the next leader hadn’t been as strong in the room as it seemed to be in the reports. Though the Telegraph newspaper reported that a majority of the cabinet had advocated a no-deal Brexit in preference to May’s plan, two people who were there said there had been no votes. Claire Perry, one of the ministers in the room, said on Twitter that only four ministers had spoken in favor of no-deal. In any case, ministers who can’t support government policy are usually expected to resign. On Tuesday evening, no one had done so. As the meeting ended after 5 p.m., May summed up. She was determined that, for once, she would be the one to announce what the government had decided. Ministers were corralled, still phone-less, in Downing Street, with only Chilean wine for comfort, while the prime minister prepared to face the cameras.